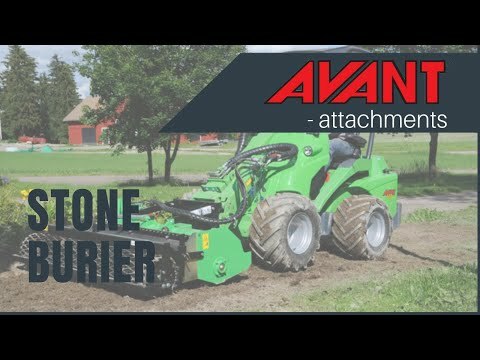 Stone Burier - Reach It! - Move It! - Crush It! A professional hydraulic stone burier for preparation of lawn beds. The stone burier mills the soil, buries eventual stones and other objects up to 150 mm depth in a single pass, making a milled and tamped topsoil. Working depth is steplessly adjustable with the rear field roller. With the optional seeding unit you are able to make a ready lawn surface on one pass. Stone buriers are most commonly used when the topsoil needs to be milled thoroughly. The soil is milled more thoroughly and deeper than with a rotary harrow.